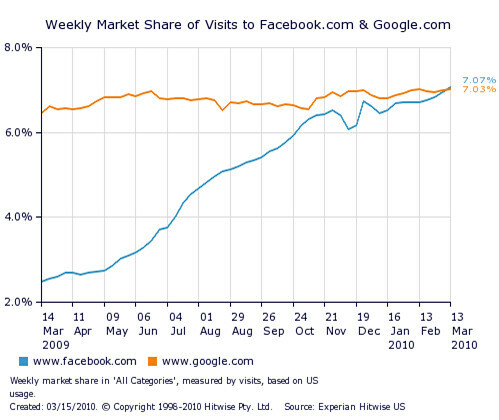 Hitwise reports that Facebook.com surpassed Google.com in visits to become the most visited website for the week ending in March 13, 2010. It is not the first time this has happened, on Christmas Eve, Christmas Day, and New Year’s Day as well as the weekend of March 6th and 7th Facebook.com surpassed Google.com as well. It is important to note, that this only is Google.com traffic. It does not include Gmail, Google News, and Google's other properties.